If you've never tried a bath or shower with a product made with mint oils - you haven't lived! There is something phenomenally invigorating about washing with a body product that contains mint oil. This Balance Me skin brightening body polish is a natural, exfoliating body wash packed full of natural ingredients and scented with spearmint oil which gives is a really fresh scent and makes the whole experience refreshing and renewing. I tend to use a body exfoliant about once a week to help brighten the skin and bring out the "new" me but I'll admit, I do like a really good scrub to help me feel as good as new. The Balance Me body polish helps exfoliate through its main ingredient - natural sea salt. I find it most effective when I use it on dry skin but you can use it as a more regular body wash if you apply it to wet skin. Because the product comes in a squeezy tube, the lotion has to fit through a small hole, which means that the salt crystals can't be that large...I think this limits its ability to give a really good scrub! However, I do LOVE the minty zingy smell when I use it in the bath - it gives an instant cooling feeling after a hot run! The polish does also leave the skin feeling good afterward - perhaps not as exfoliated as I'd like but certainly you can feel the effects of the moisturising ingredients such as Shea Butter, sweet almond oil and coconut oil. If you have dry skin on your feet, Balance Me body polish makes an awesome foot scrub as the combination of exfoliation and cooling mint is the perfect pedi-combo! 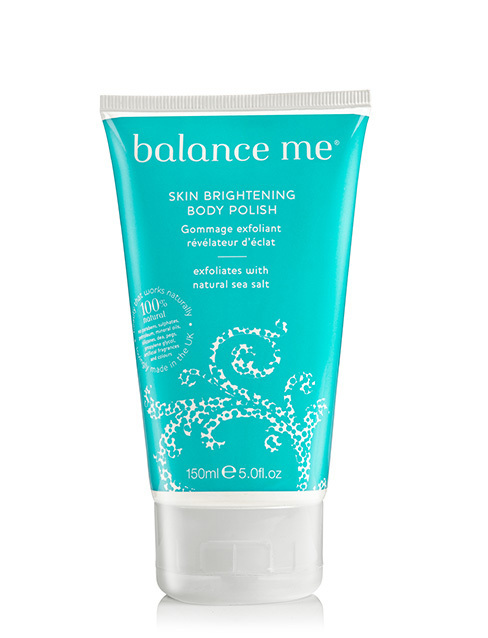 The Balance Me Skin Brightening Body Polish costs around £18 for 150ml.